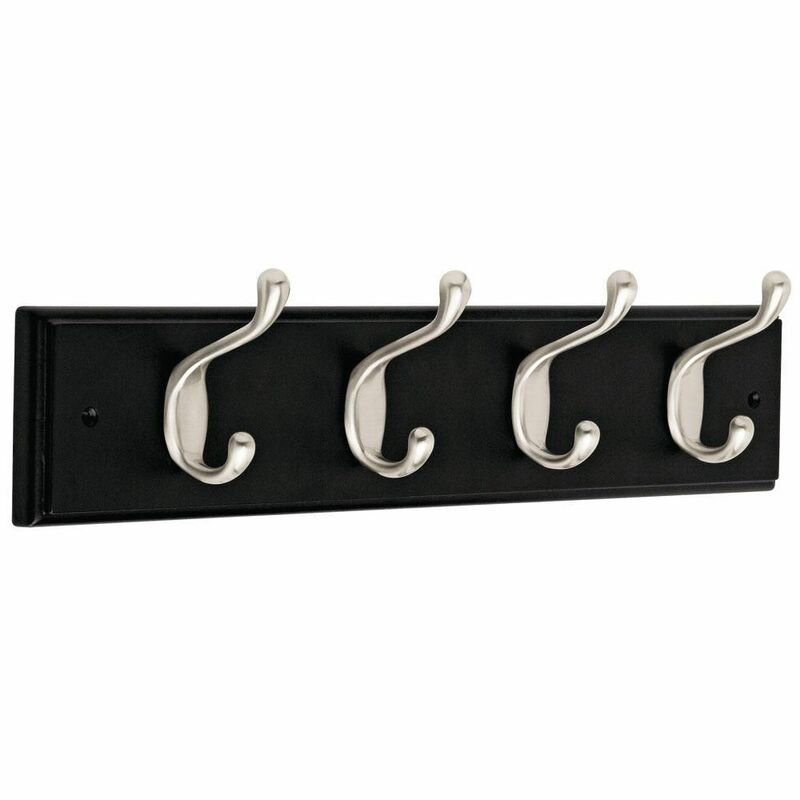 The Amerock HR55656G10 Decorative Hooks 18in(457mm) Hook Rack comes in White/Satin Nickel. The classic Satin Nickel finish provides a sleek, lightly brushed, warm grey metallic look. The Amerock HR55590MS Decorative Hooks 8-5/8in(219mm) Key & Gadget Hook Rack is finished in Mahogany/Silver. Use to hang keys, gadgets and more. Mahogany is a deep, rich dark wood finish with subtle variations of graining. Silver finish is a cool grey metallic look, often shiny and polished. Make a simple but illuminating design statement with the Bennet shelf. It's the perfect way to welcome anyone in your home, holding coats, scarves, keys, cell phones, sunglasses, or anything you need close at hand when you leave the house. This shelf's rich brown finish helps complement any decor. 18 in. Rail w/4 Heavy Duty Hooks SNB Organization with style has never been so easy. This wood rail with four metal hooks is designed to hold a wide variety of items coats, hats, handbags, umbrellas, towels or robes. This classic design is perfectly suited for any room from the entryway to the bathroom. 18 in. Rail w/4 Heavy Duty Hooks SNB is rated 4.7 out of 5 by 20. Rated 5 out of 5 by twilly from Great looking and well made!... Great looking and well made! Rated 5 out of 5 by HomeDepotCustomer from Very nice hook for my keys and one of my... Very nice hook for my keys and one of my cowboy hats near the door. Rated 5 out of 5 by HomeDepotCustomer from Holds coats and dog leashes, book bags like a charm.... Holds coats and dog leashes, book bags like a charm. Happy! Rated 5 out of 5 by MacEwen from I bought this over 1.5 years ago. It sat in the box until last week. I wasn't sure if I wanted ... I bought this over 1.5 years ago. It sat in the box until last week. I wasn't sure if I wanted to mount it or not, or at least where to put it. After an old hook broke on out bathroom door, I decided to mount this to one of the rails of the raised panel door. The black accent works excellent with the color shceme we have. More importantly this set of hooks looks GREAT!, and works great. On this black model, it includes two black countersunk wood screws. They worked excellent. I dont recall if plastic wall anchors were included in the first one we bought. I bought a 2nd one today, and mounted it. No plastic wall achors were include, just screws. Again I didn't need them, but some may, if they want to place it on drywall where there aren't a stud handy. I could not be more pleased with these. Rated 5 out of 5 by Deee from Great hoks I bought this for all my dogs stuff and it works great no more leashes & coats all over the place. I was eazy to install.